Allentown is a city located in Lehigh County, Pennsylvania, United States. Start off your visit on the 7th (Wed): stroll through Kalmbach Park and then enjoy some diversion at Coca-Cola Park. To see photos, maps, where to stay, and more tourist information, refer to the Allentown trip site . Philadelphia to Allentown is an approximately 1.5-hour car ride. You can also take a bus. Traveling from Philadelphia in November, you can expect nighttime temperatures to be a bit cooler in Allentown, with lows of 35°F. Wrap up your sightseeing on the 7th (Wed) to allow time to travel to Gresham. Gresham is a city located in Multnomah County, Oregon, in the United States, immediately east of Portland. 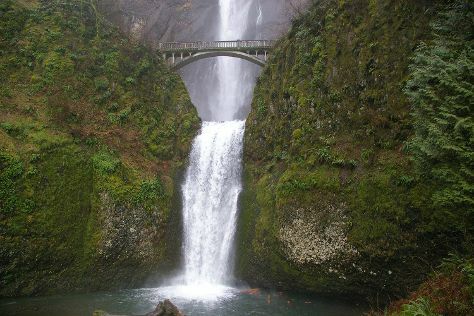 Start off your visit on the 8th (Thu): identify plant and animal life at Oxbow Regional Park, then explore the striking landscape at Oneonta Gorge, and then steep yourself in history at Columbia River Highway. Keep things going the next day: admire the sheer force of Multnomah Falls, then take in the views from Bridge of the Gods, and then see human ingenuity at work at Bonneville Lock & Dam. To find photos, other places to visit, more things to do, and other tourist information, you can read our Gresham travel planner. The Route module can help you plan travel from Allentown to Gresham. The time zone difference when traveling from Allentown to Gresham is minus 3 hours. Traveling from Allentown in November, Gresham is a bit warmer at night with lows of 43°F. Finish your sightseeing early on the 9th (Fri) so you can travel back home.